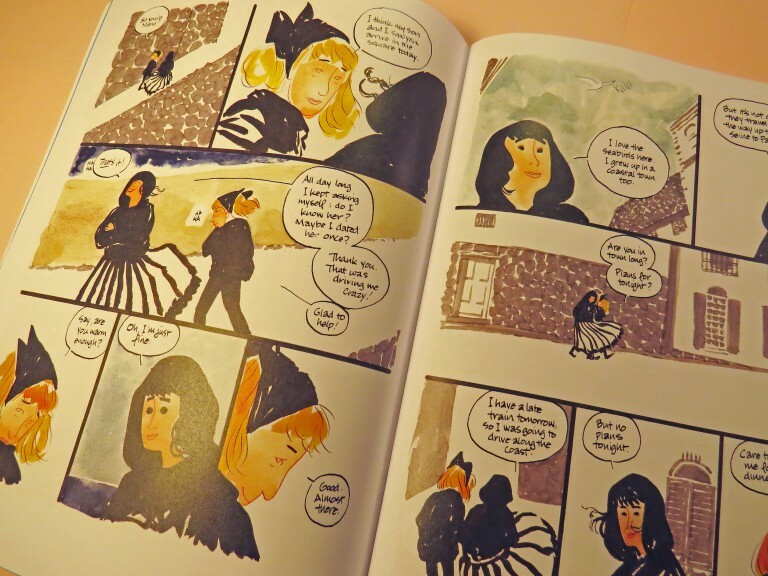 Since I discovered Frank Santoro’s comics in 2007 with Cold Heat (done in collaboration with Ben Jones), I’ve been a huge fan of his. With a fine arts background and steeped in the history of comics, Santoro is as well known for his art as he is for his opinions on the artform, and, in recent years, has become possibly better known as an educator for aspiring comic artists. 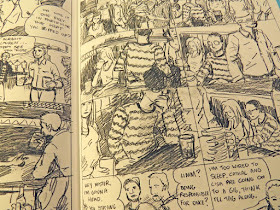 To this end, Santoro ran a correspondence course for a number of years—and, more recently, has run an annual “Composition Competition” through the Comics Workbook tumblr, with cash prizes for the winners—and when afforded the opportunity to purchase the rowhouse next to his own, in Pittsburgh, he raised the money necessary, so that he could start his own comic creators’ residency—the ComicsWorkbook Rowhouse Residency. 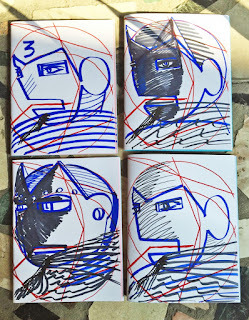 One of the ways Santoro works to defray the costs of the residency is through the Comics Workbook auction site, and one of the items available for purchase has been a quarterly anthology comic, with work from Santoro as well as former students of his correspondence course (and resident artists, I must assume). The most recent issue, number 3, is well worth your time and money. 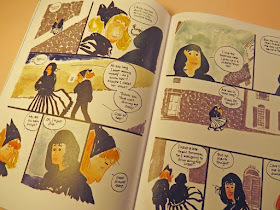 The first story, GULLS, by Kurt Ankeny, is one of the most beautiful comics I have read all year. Using watercolors, adding a soft intimacy to the story, Ankeny relates a day in the life of a mother and son in Paris, where they live. Sitting on a bench in a park, they both share a longing gaze, searching, still, for that someone who can fulfill their lives and make them whole. They discuss, briefly, Edouard’s absent father (his parents long since divorced), as well as the many conquests of Edouard, while his roving eye spots a lovely young woman walking along the cobbled sidewalks. Soon enough, they go their separate ways. His mother has a photo shoot, and Edouard has a date that night, for which he must prepare. At the shoot, the mother realizes one of the models is the woman she and her son saw, while sitting on the bench earlier. Once finished, she and the model, Marie, discuss her plans (she has a late train to catch, the following day, but no other plans) and the mother invites her to dinner. Which ends with the two women together in bed. As they lounge under the covers, the mother receives a call from Edouard—his date went poorly. This prompts Marie to ask how her date went. “Lovely,” she says. In only ten pages, Ankeny offers readers a trio of well-developed characters, roaming through life as they try to make sense of it all, and try to find love—or at least companionship—along this journey. It’s an incredibly touching story that resolves satisfyingly, while also leaving narrative threads for the audience to follow, in their own minds, once they turn that last page. A great read. Story #2, ALABASTER TREES, by Jacqueline Huskisson, is an existential Möbius strip that twists your brain into a pretzel and then folds in on itself again. Huskisson’s confidence in her narrative pulls you along as a young girl (or boy) travels to the strange forest seen from the child’s bedroom window. There, a wolf (or is it the spirit of a wolf?) greets the child, stating that a price—though not as high a price as the severing of one’s limb—must be paid for entrance. (Cookies suffice) The child comes and sits at the campfire, a campfire that smells of every campfire ever, and which affects the child in a significant way, though what that might be is up to the reader. The following day (or is it a week? ), back at home—with an alcoholic mom, an oblivious father, and a “useless” baby—the child decides to take its younger sibling out to the forest. There, the wolf inhales the spirit of the baby and transfers it to the skeleton that resides at its feet. When the child returns, having deposited its baby sibling at home (despite its loss of a soul), it is confronted by this newly animated skeleton, which decapitates a deer with its bony hands, offering a stream of blood for the child to imbibe. Drinking deeply, the child awakes, believing it all to be a dream. But was it? 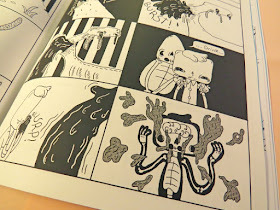 Huskisson’s art is reminiscent of Michael DeForge’s distinct style. This stark, and sharp, approach complements the story nicely, imbuing it with a heightened sense of unease and discomfort that makes it resonate, once you finish reading it. Good stuff. The third story, CAUGH IN THE LIGHT, by Paddy Lynch, relates a “night in the life” of old friends, as James returns to his hometown after six years in Asia. His friend Lauren has offered him a place to stay, if he doesn’t mind the futon, and after cleaning up the two go out to the pub where they all used to hang out. Over the course of the night, we meet Chris (who is married) and hear of Cathal and Lisa, whom James joins, when they’ve had enough of the pub, while Lauren goes home to get some sleep. Except that, after James has returned to crash on the futon, he sees Chris leaving quietly, in the middle of the night. James is worried about Lauren and tries to talk with her about Chris. But she’s a grown woman who doesn’t have the time, or the desire, to discuss it. She can take care of herself. Over the last few pages more is revealed (through the imagery and snippets of dialogue) about Lauren’s and James’s current plights, and it all seems fated to end poorly. Until we reach the final panels, and a light at the end of this tunnel is offered up to the readers, providing a wealth of narrative possibilities, and a more than satisfying end to this short story. Lynch deftly melds art and writing within these ten pages, enlarging the canvas nicely with the juxtaposition of words and pictures, while also allowing the silences to carry along the narrative when it is warranted. The more sketchy style of the artwork adds to the characterizations of the players in this tale—especially that of Lauren, who is out on a limb as far as her employment and her love life—and, as with the previous stories in this issue, enhances the overall effect of the narrative. I was impressed with how assured, and how complex, this story was, most obviously revealed through the dialogue. This was a great story that, like the rest of this issue, I look forward to returning to. 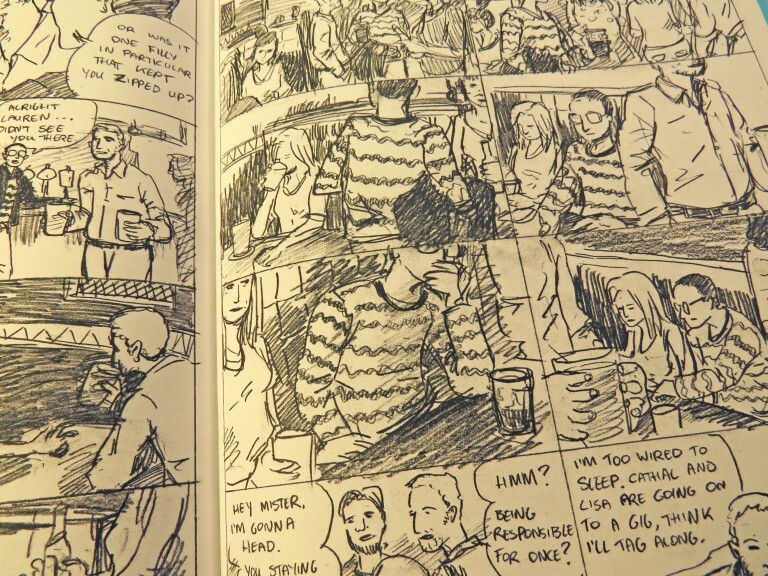 The final story, GUILT CAME ALONG, by Tyler Landry, is more a comic poem than a straight narrative—a meditation on guilt through pictures, with an economy of words dotting the images. And it is beautiful. Landry is working in stark black and white with this offering, reminiscent of Mike Mignola’s art without aping Mignola’s distinct style. It’s a haunting tale crafted within a stack of three panels per page, sans gutter, a layout that Landry uses to great effect, allowing the imagery from one panel to bleed into the next, expanding on the meaning of the pictures while enhancing the sense of melancholy and regret that infuses these ten pages, an effect that might be lost in a more traditionally guttered panel layout. 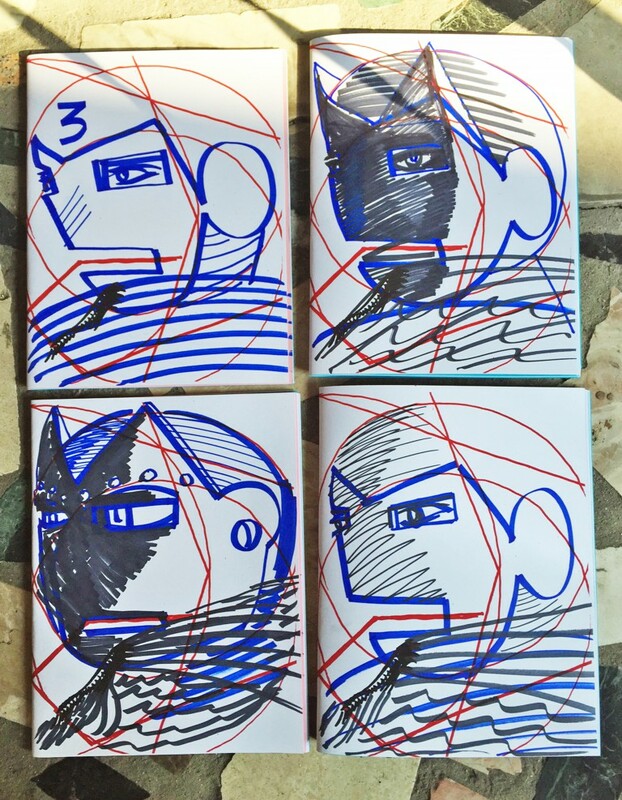 Like the other stories in this issue of Zona, it’s a matter of form following function. As with any good poem, this story demands one read and interpret it for oneself. I could state what I think it all means, but it would be replete with personal biases, informed by my distinct experiences. Others will bring to this piece their own backgrounds and perspectives, affording them a different, yet just as legitimate, understanding of the story of this main character, an older man walking through the woods. 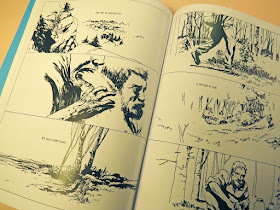 “Guilt Came Along,” and the whole of this issue, is another wonderful example of the comics being created outside the normal publishing channels of the comic book medium. Truly amazing work. I have enjoyed every issue of ZONA thus far, but this most recent publication, with its wide variety—not only in artistic approach but also in genre and storytelling style—has been the best issue to date. All of these artists created insightful and engaging narratives—in only 10 pages—that stand with the best comics being produced by today’s larger publishers. You need to check this out. Now!